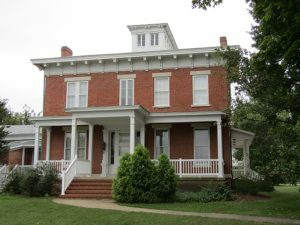 Henry, Illinois bed and breakfasts welcome you to our peaceful town by the river. Come stay with us and discover the tranquility of river life! Instead of looking for hotels in Henry, IL, consider one of our beautiful inns, offering warm welcomes and pleasant ambiance. The hospitality shown by our innkeepers beats any hotel front desk around! Our B&Bs offer the best of Henry, Illinois lodging. And once you’re settled into your room, join other guests and the innkeepers in the common areas of the house to hear about the best sights and activities in the area. Or, if you’ve been to Henry before, bestow your knowledge to other guests. The Illinois River is a major draw to Henry. Where there’s this much water, there is activity, nature, and sights to behold! Boating, fishing, and swimming are obvious river activities, and the Henry Waterworks Park hosts riverside events throughout the year. If water activities aren’t your thing, then you may appreciate the history of Henry more. As the site of the first lock and dam on the Illinois River, Henry is known as the “best town in Illinois by a dam site.” The river is what brought settlers to the area, and it is also what put Henry on the map. Of course, Henry is within an hour of both Chicago, and the Quad Cities, if you want a busy interlude to your restful Henry vacation. Also located between the Northern Illinois Wine Trail, and the Illinois River Wine Trail, Henry is the perfect vacation spot for wine lovers! The Henry member inns of the Illinois Bed and Breakfast Association invite you to discover Henry for yourself!